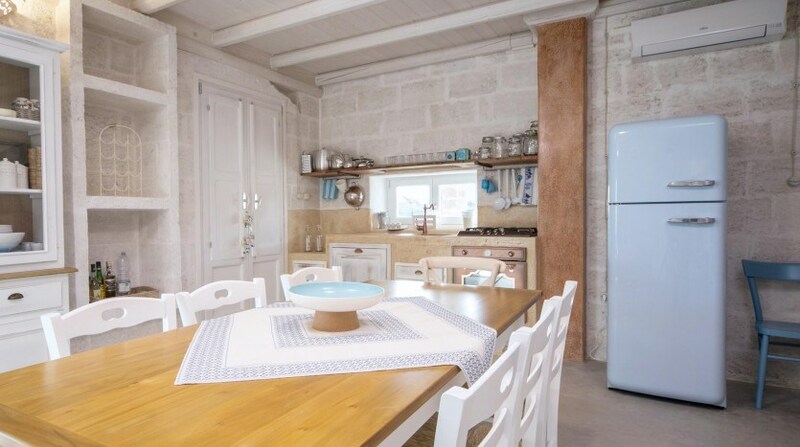 A lovely new trullo, tastefully furnished and perfect for your holiday in Southern Apulia with its close proximity to the splendid beaches of this region. 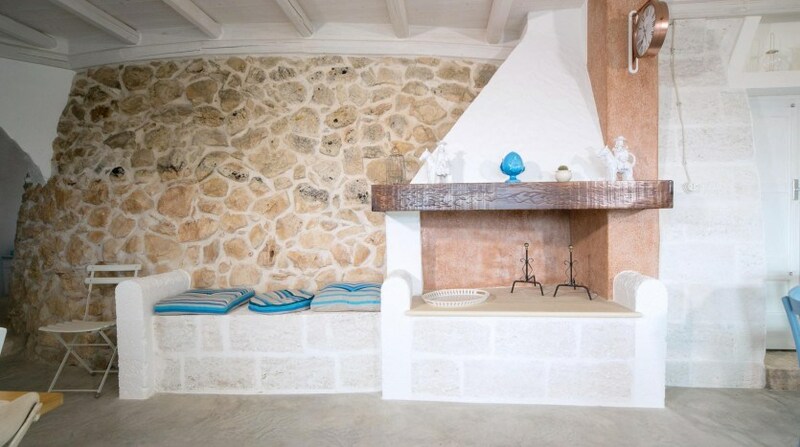 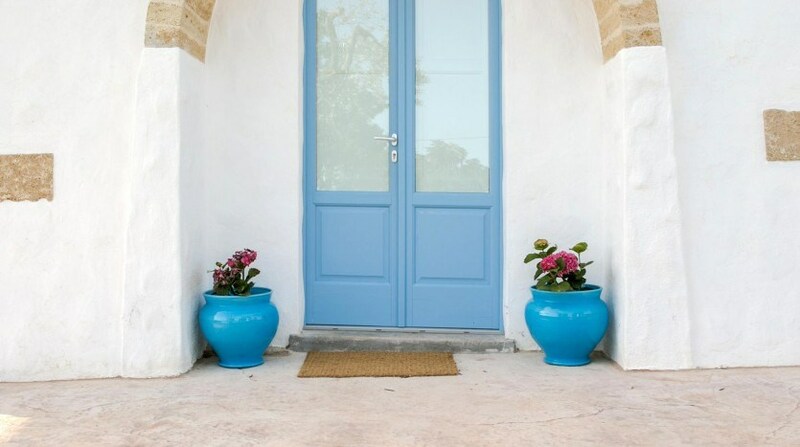 A beautifully restored, historic trullo with swimming pool and accommodation for up to eleven guests. 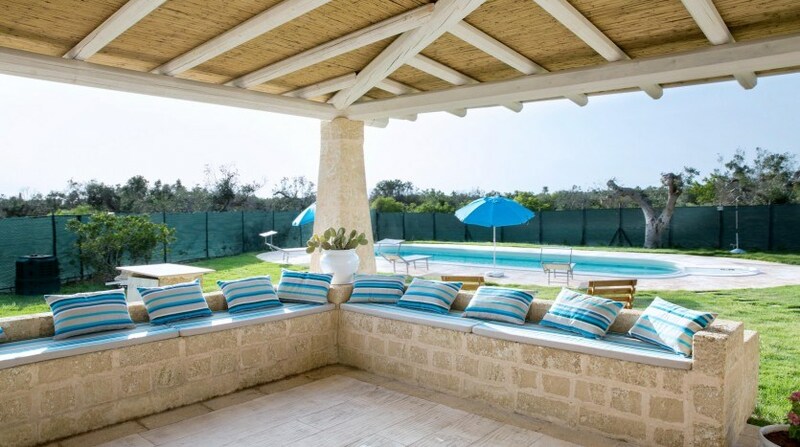 This charming holiday villa with pool in Apulia comprises three living units with a total of four bathrooms and four bedrooms. 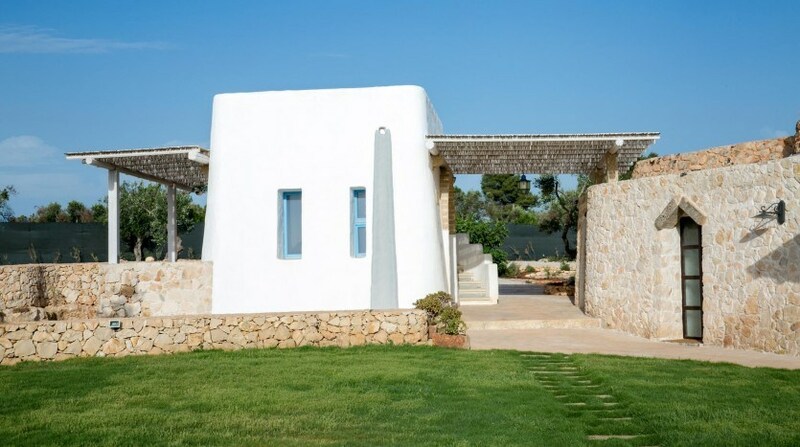 The villa nestles in private grounds covering 4,600m2. 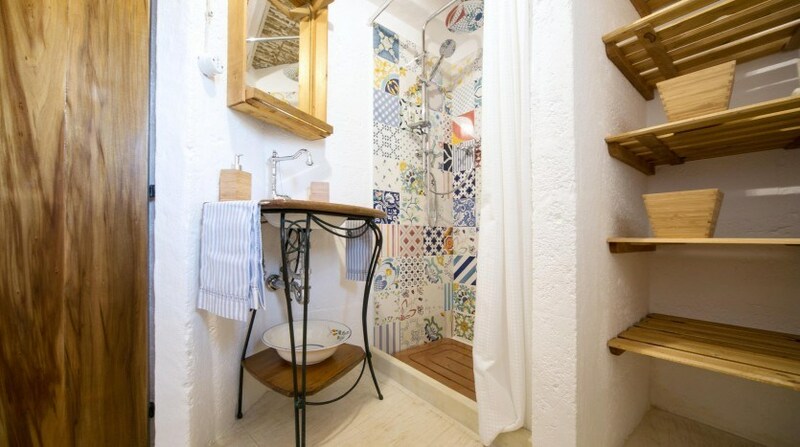 The property is in a quiet location not far from Torre Suda. 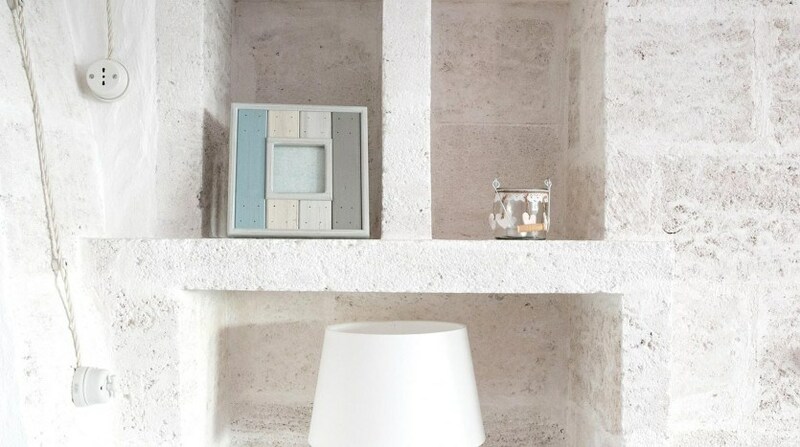 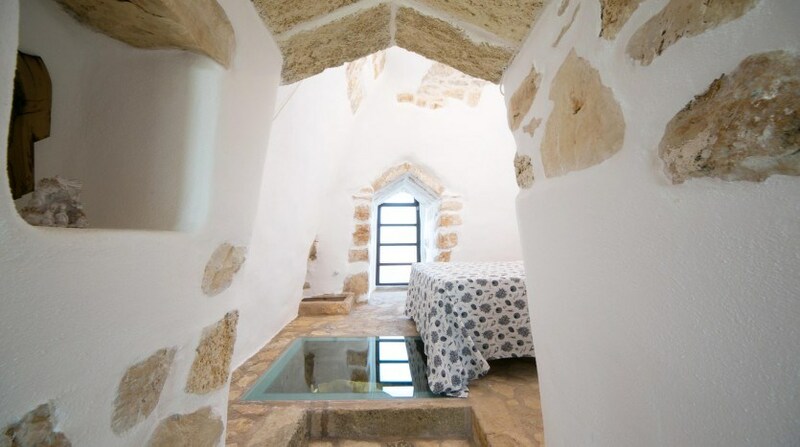 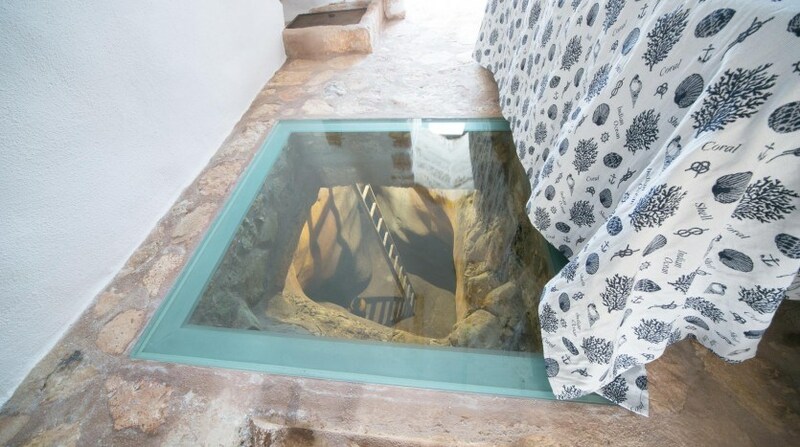 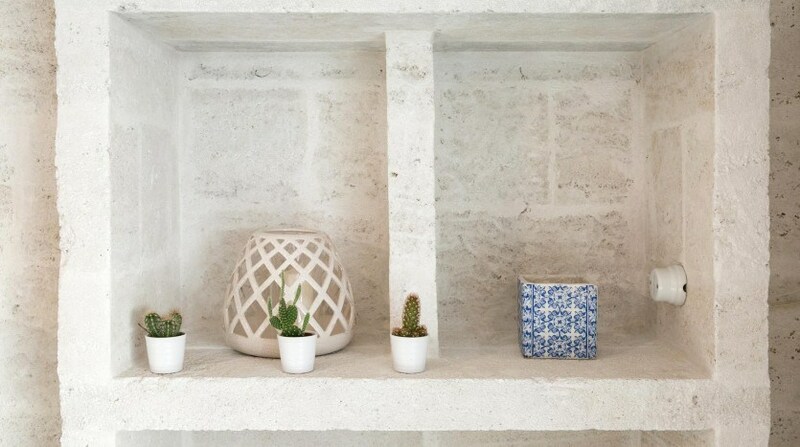 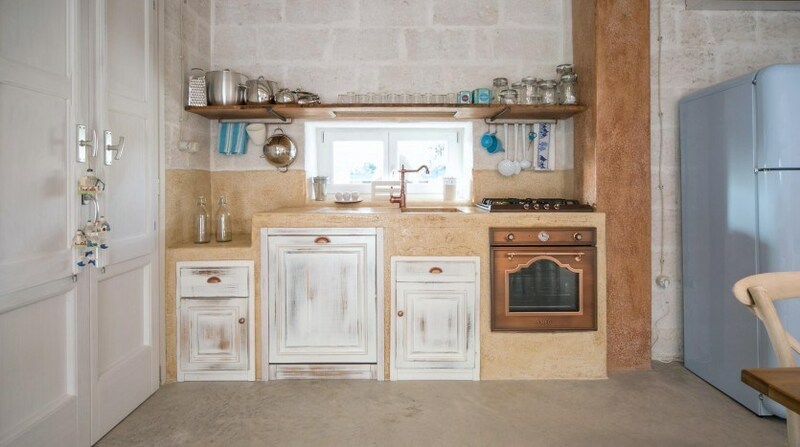 The larger trullo comprises two bedrooms, and the other two bedrooms are found in the two adjacent, smaller trulli. 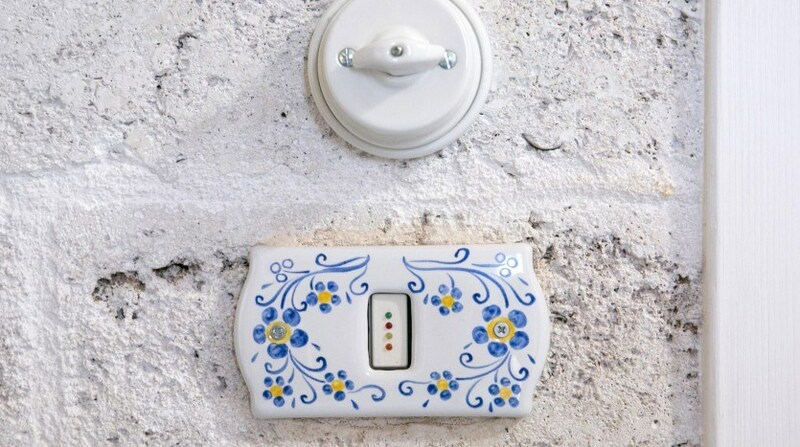 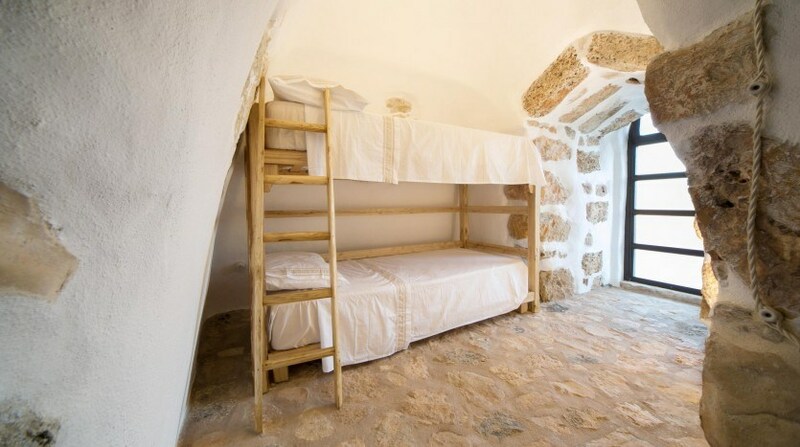 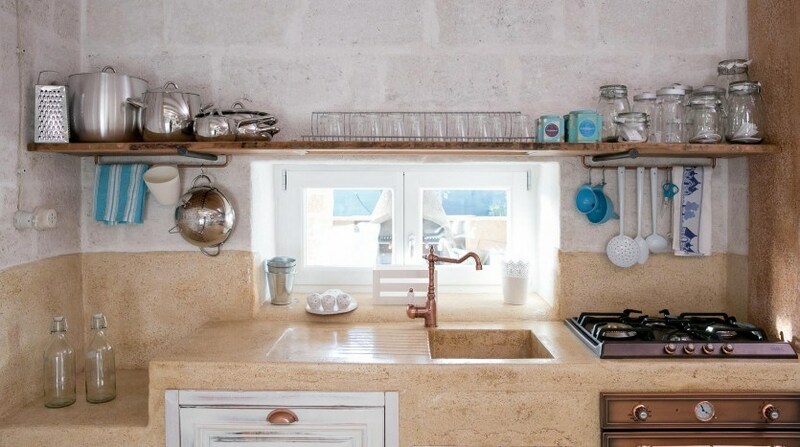 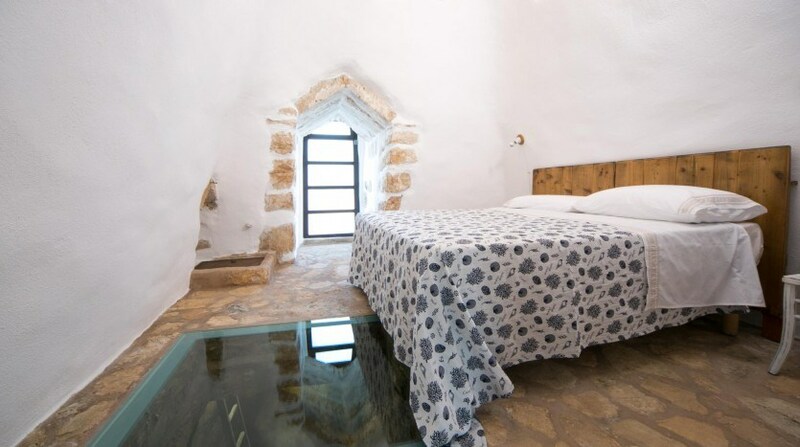 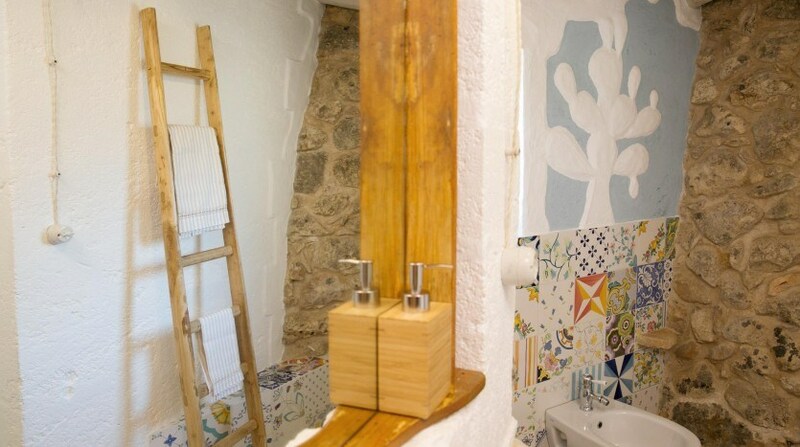 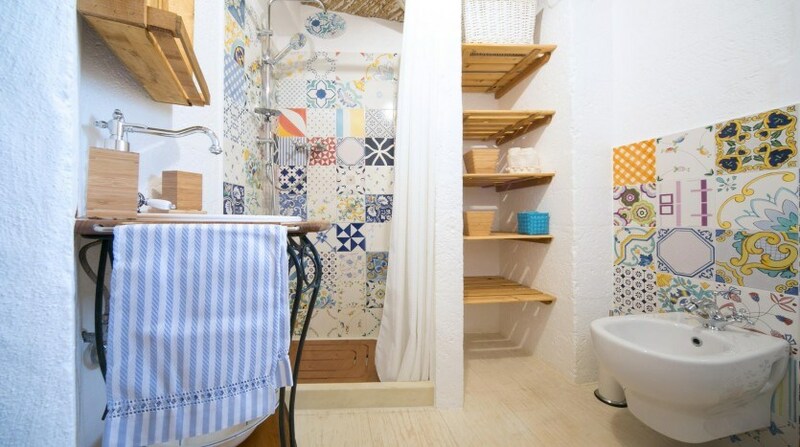 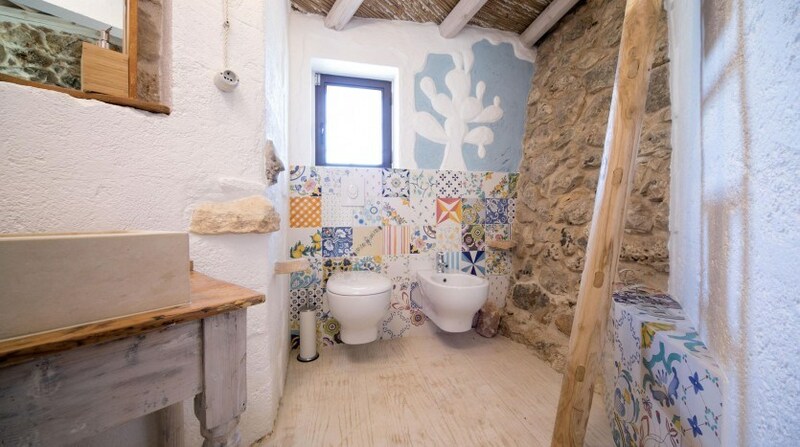 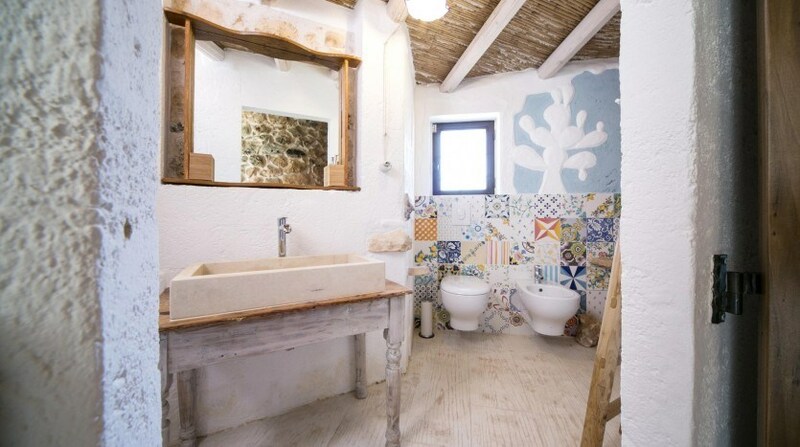 These delightful trulli offer tastefully decorated bedrooms in a rustic style, modern bathrooms and all the modern amenities such as a well-equipped kitchen with dishwasher, air conditioning and much more. 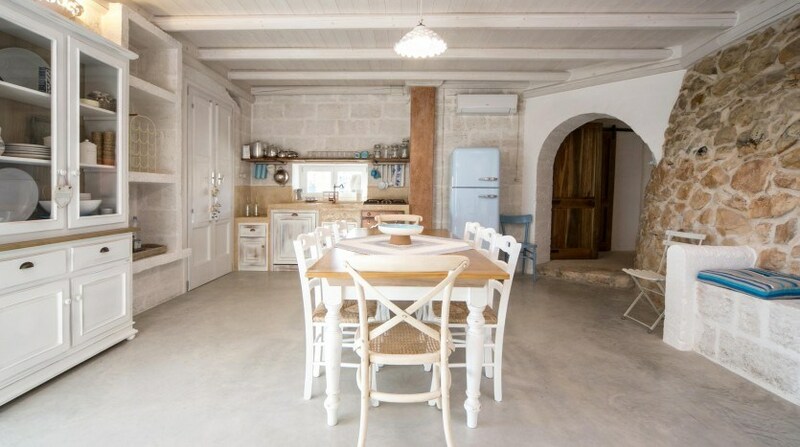 Pets are given a friendly welcome in this villa. 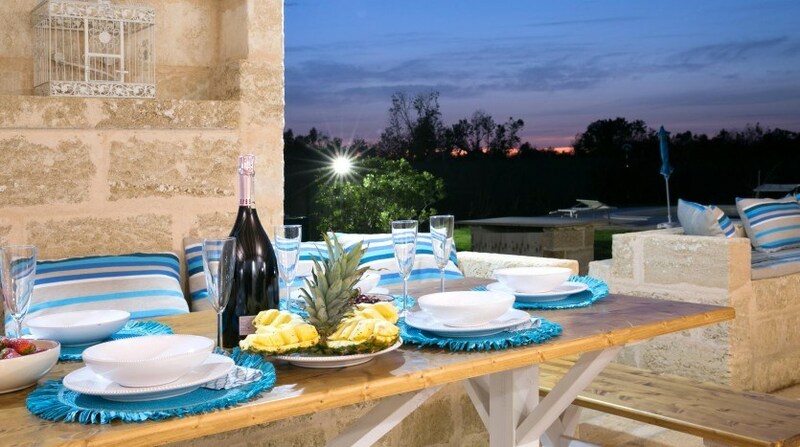 Relax in the grounds of the villa and admire the romantic sunset. 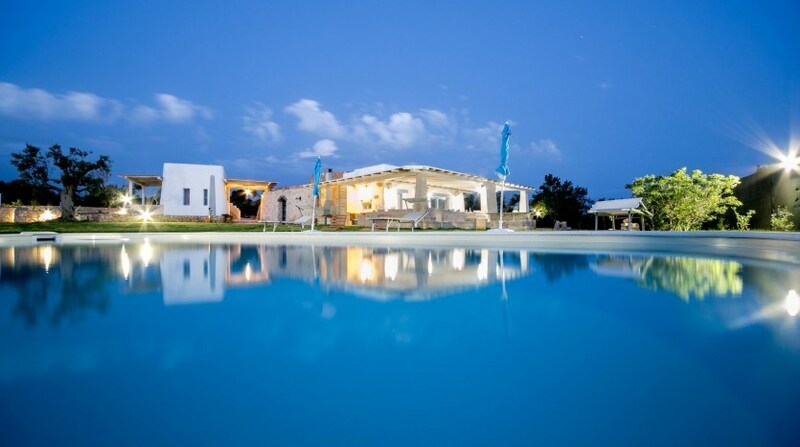 The large, luxurious swimming pool invites you to a refreshing dip. 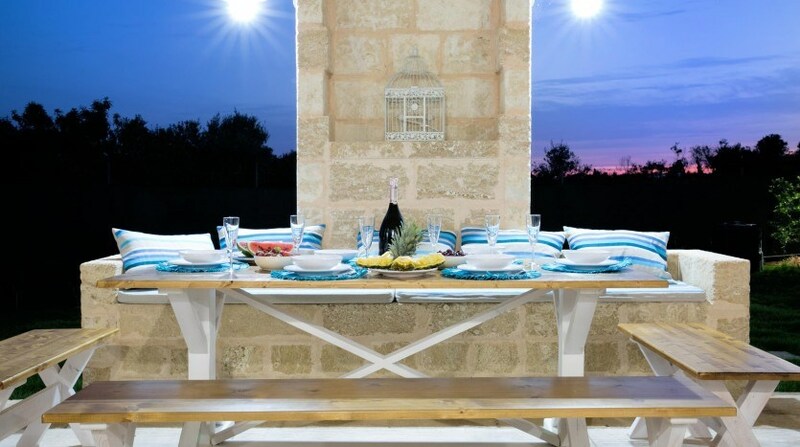 Enjoy dinner under the lights of the property’s lovely evening illuminations. 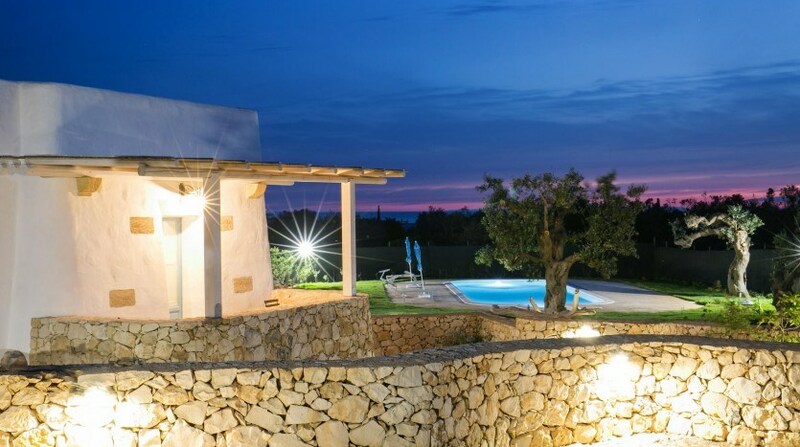 Your holiday in Apulia in this delightful villa with swimming pool and extensive private grounds will stay in your memory for a long time. 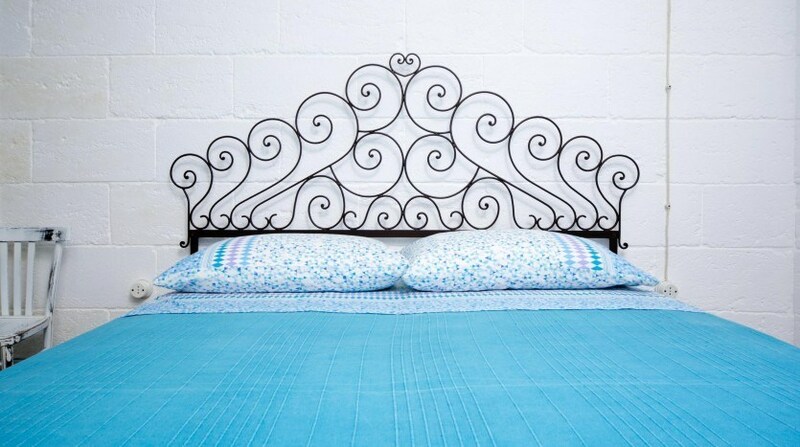 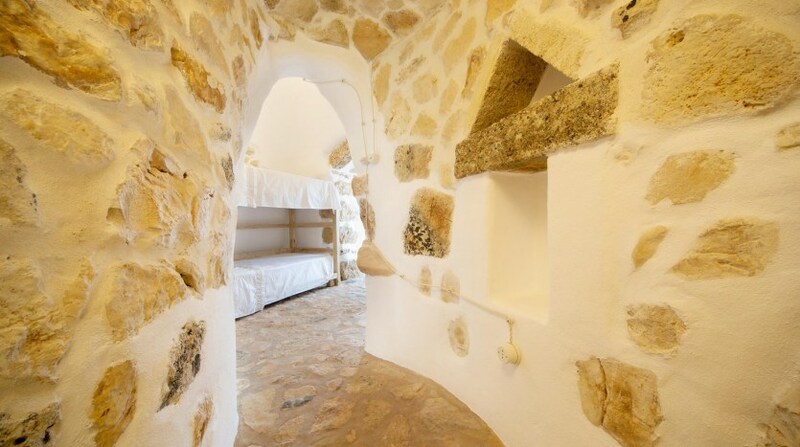 Each trullo has one bedroom with double bed and air conditioning. 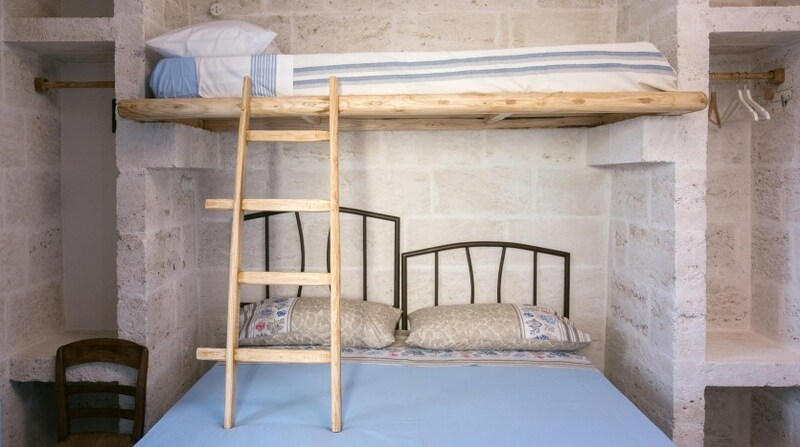 Another bed can be added. 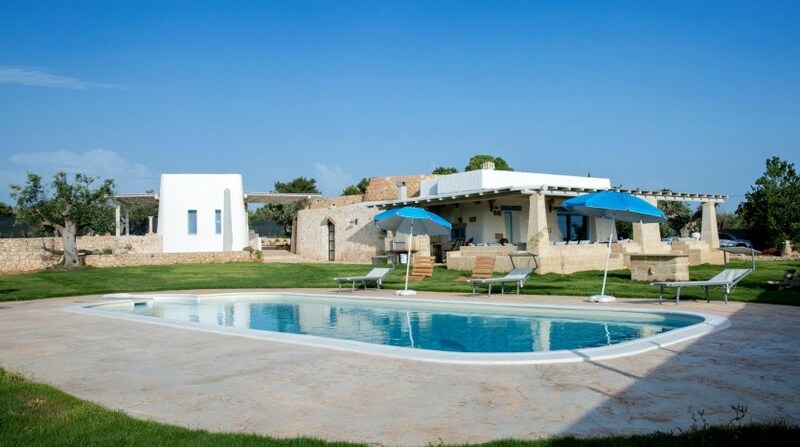 Villa Il Trullino lies only 1.5km from the sea. 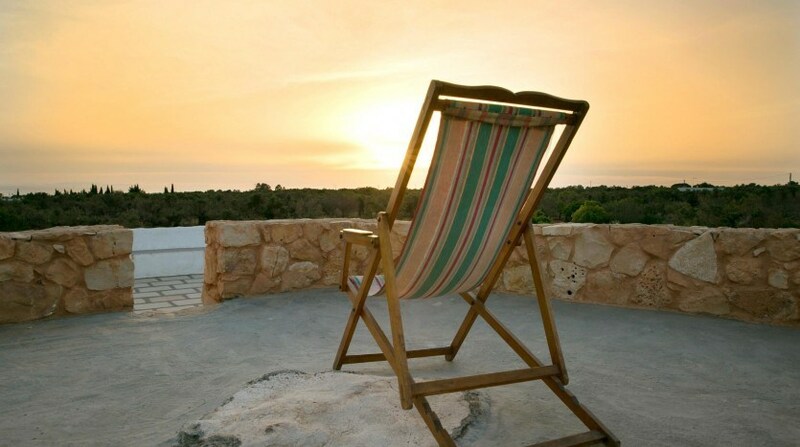 Torre Suda is a district of Racale, a pretty seaside town in Apulia on the Ionian side of the Salento Peninsula. 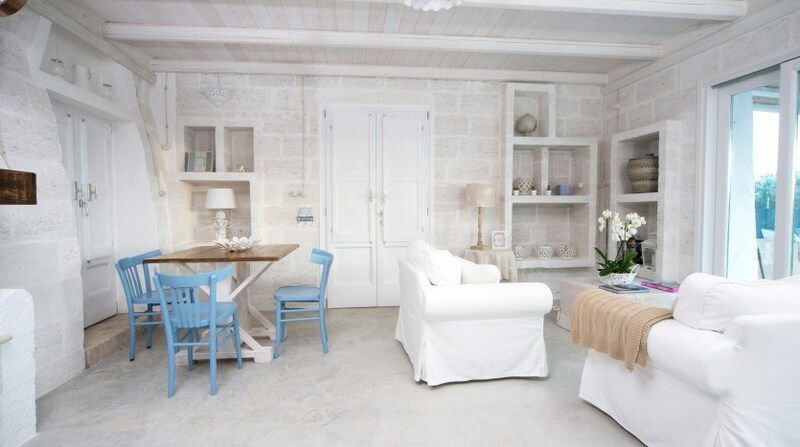 The seawater on this coast is clean and clear. 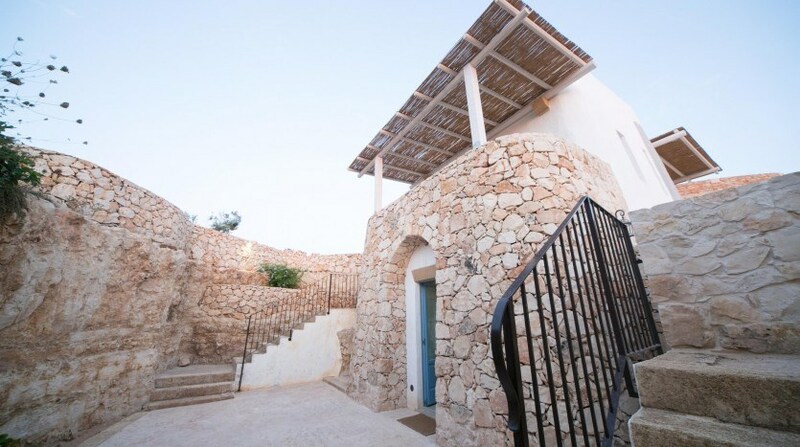 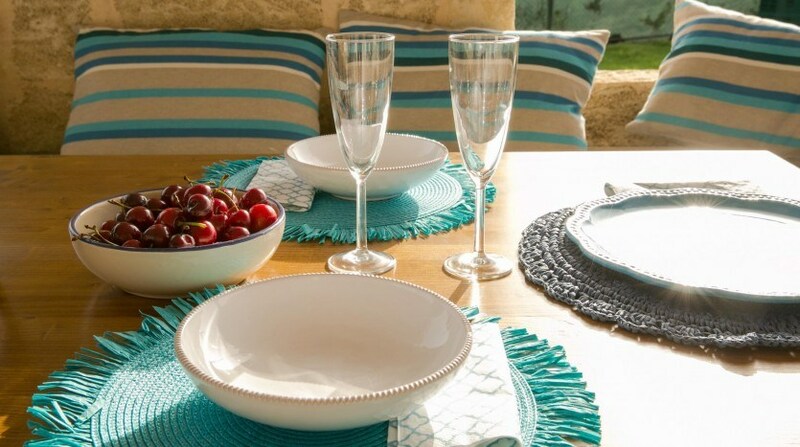 Explore a variety of small bays with their typically Mediterranean vegetation. 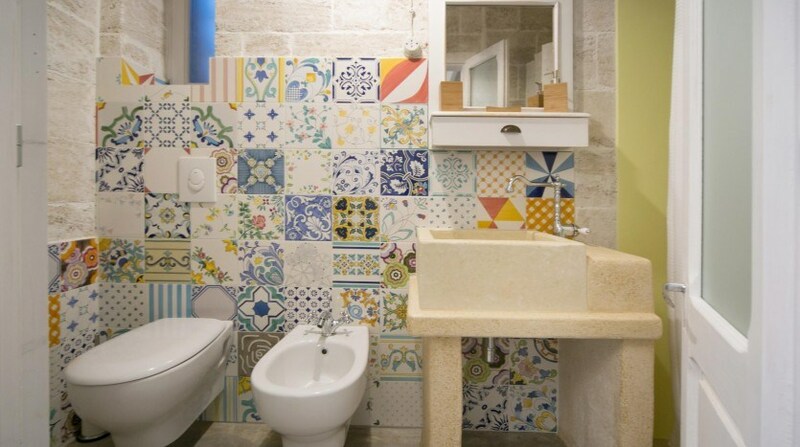 Torre Suda is located in the province of Lecce, to the south of Gallipoli. 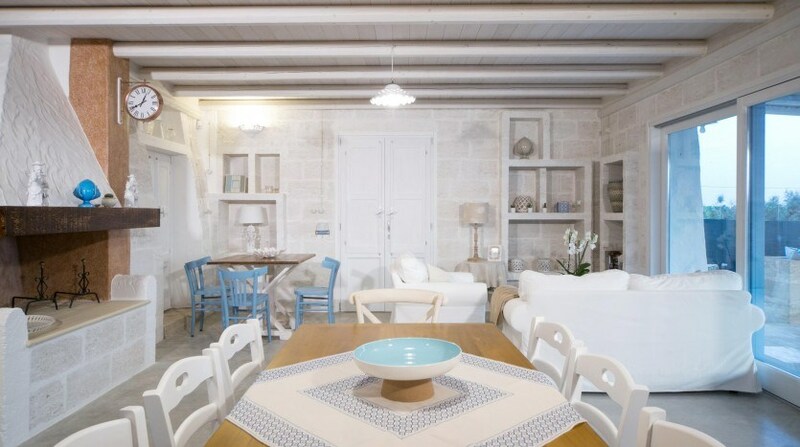 It is often chosen as a travel destination in Apulia, not only thanks to its proximity to Gallipoli but also to avoid the typical holiday chaos. 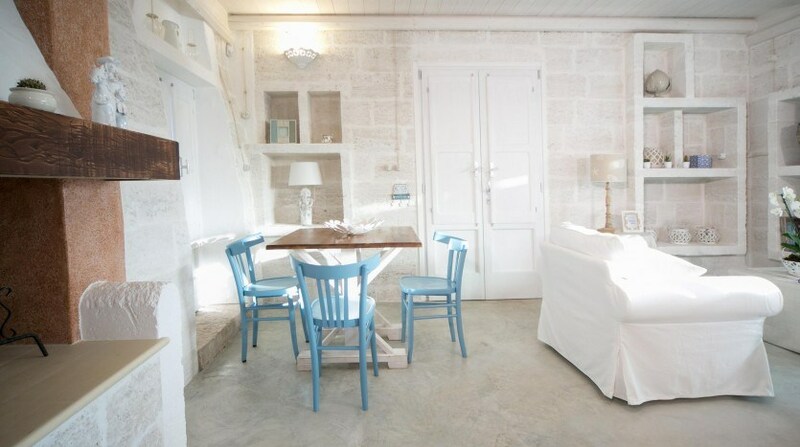 Underwater fishing and snorkelling are popular pastimes on this coast. 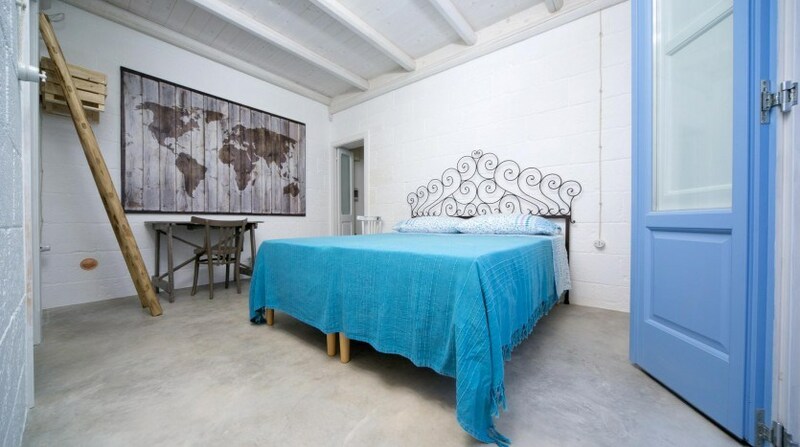 Bed linen, towels, gas, water, electricity, WIFI internet, final cleaning. 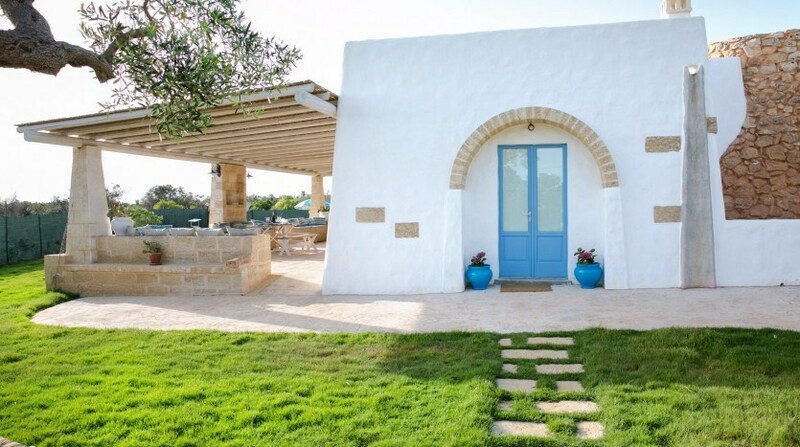 Arrival and departure from June to September on a Saturday. 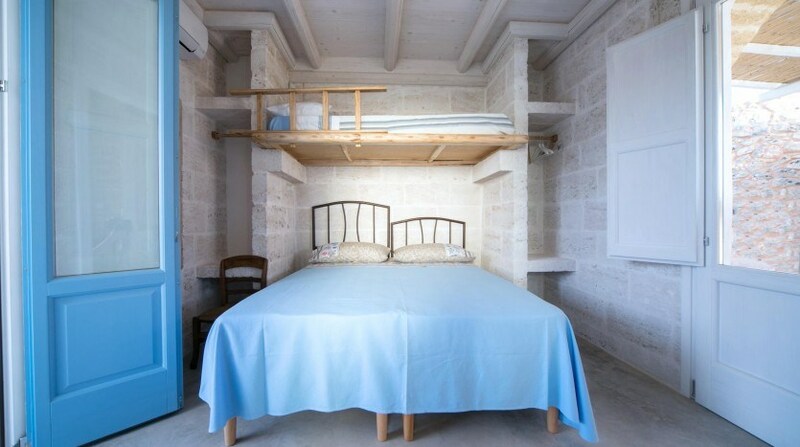 For an occupancy of more than 8 persons supplement € 150, – per person and week.